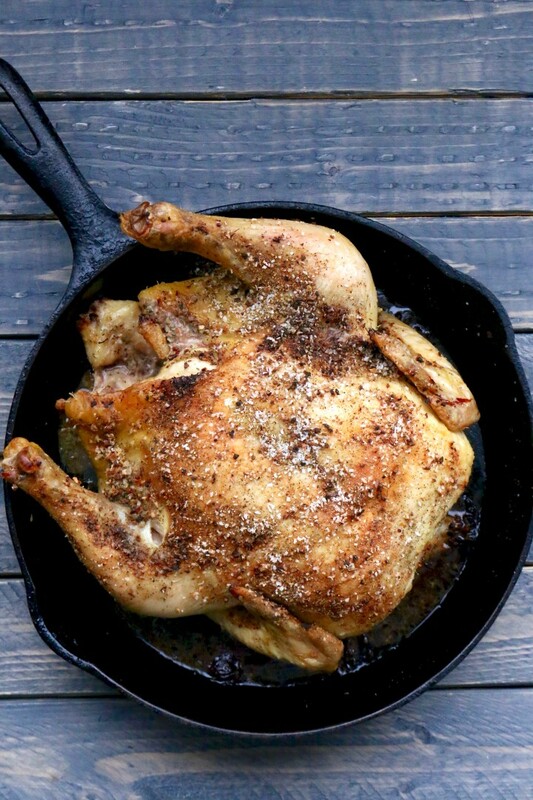 This cast iron chicken is the best, it takes one pan, one chicken, and one hour to cook. Winner, winner, chicken dinner. Sorry I couldn’t resist 😉 I knocked out two birds with one stone with this recipe. This month’s goals include better eating habits and menu planning and this chicken fits the bill for both. Woo! Yes we are only one week in to the new year but I am really feeling the whole menu planning / meal prepping thing. Eating better doesn’t automatically happen (for me). Planning and prepping need to happen if you (I) want to maintain success. I chopped up all my lettuce for ready to go dinner salads, roasted a chicken that I have been eating in quickly made chicken salads for lunch, made bone broth overnight in the crockpot with the chicken carcass, made homemade mayo, roasted Brussels sprouts and potato wedges, and baked a bunch of bacon for quick breakfasts. My cast iron pan is my favorite and most used pan. And by most used I mean twice a day. My mother-in-law gifted me a cast iron skillet and from then on I was hooked. My collection has grown since then and now I have eight in various sizes. I brought two with us last summer when we went on an epic two week family road trip. I cooked our meals over the fire and we had a weapon if we needed it (joking / not joking….somehow I don’t think a curious bear or mountain lion would be frightened of my pan). Hit up those thrift stores and garage sales and snag yourself a cast iron pan. Hunting down old cast iron not your thing well snag yourself one from Amazon. I promise you will want to cook everything in it! What is your favorite thing to cook in a cast iron skillet? I have been reading a lot about cast iron pans and I have been scared to buy one. Your post has pushed me over the ledge. YUM trying this one for sure. Love cooking in my cast iron skillets. Chicken looks delicious. This chicken looks delicious and I can’t believe all you did was season it! It looks like a lot more effort went into the dish. You could do anything with chicken cooked this way – I might make a nice Chicken Salad! Wow this looks amazing. Thanks for sharing! It broke?! What a sad day. Jamie! This looks amazing! Sounds like it is so easy, too! Gorgeous photos!! That chicken looks perfect. 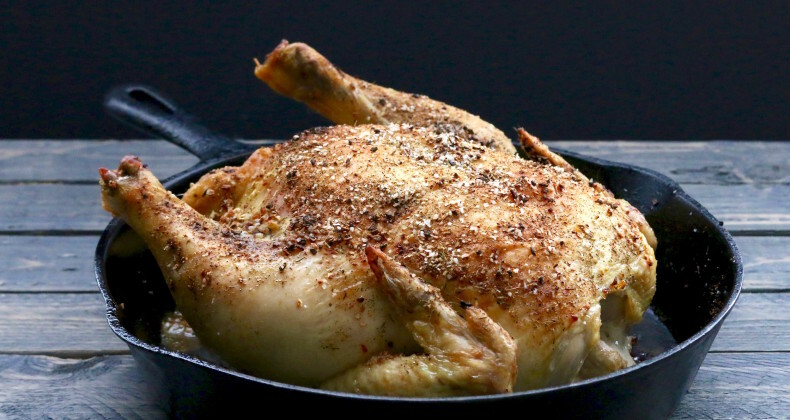 I love my cast iron skillet and I love roasting whole chicken but I have never used my cast iron skillet to roast a chicken. I need to try it! Thanks! Thanks Marlynn! Bust out that cast iron and get to roasting. Winner Winner chicken dinner 🙂 That made me laugh. I love roast chicken. My family thinks it’s a feast and it is so easy peesy! Anytime I can have a feast with little effort I will take that victory! Fab chicken recipe, thank you for sharing! I will have to try it soon! I’m curious– what size pan did you use? Looks fantastic & easy! They totally are a workout worth pan 🙂 I think we tend to overcomplicate things but a roasted chicken is easy, delicious, and versatile! LOVE how simple this is, and especially for my beloved cast iron 😀 My husband will love it, too! You, your cast iron, and your husband will be happy with roasted chicken 🙂 Enjoy! Ong your chicken sounds delicious!!! I’m going to have to give your recipe a try! That looks so delicious! I really need to invest in a cast iron pan. I don’t have a cast iron pan so I am green with envy! I can imagine this chicken would be a big Sunday dinner hit! I need to do pizza in my cast iron! I use a good pinch or two of kosher salt (1/2 teaspoon-1 teaspoon) and a couple cranks of the pepper mill (about 1/2 teaspoon). I hope that helps! Enjoy. Can you add vegetables with this time and temp? Can’t wait to try! You could. I haven’t done it that way. If you were thinking root vegetables the temperature would probably stay the same but the cooking time might adjust. I can’t give you a solid temperature and time, however, since I haven’t prepared the chicken that way. If you try it please report back!